Jewish Nevada's volunteer committees consider local community-building needs and global shared responsibilities, and then allocate funds accordingly. The impact of this collective funding of Federation allows us to constantly and consistently meet the needs of our Jewish family, no matter how far reaching - from across the street to across the state and around the world. The Federation, through our system of community partner agencies and grantee organizations, is able to bring together every age and segment of our community to strengthen Jewish life. Our allocations grants provide meals and programs for seniors; quality Jewish education, scholarships and summer camps for children; Israel experiences for teens and young adults; counseling activities for families; and a variety of programming and initiatives that elevate our Jewish community. 70 Organizations. 3 Priority Areas. 1 Community Federation. Thank you for your interest in applying for a grant allocation from Jewish Nevada. The allocations process is a calendar year grant cycle. More information will be posted here in the fall regarding the 2019 grant process. Event Grants are allocations designated solely for the execution of a community event (examples include Menorah Lightings, Sukkah Events, Pop-up Shabbat, Celebrate Israel, etc.). Fundraising events are not eligible for grant funding. 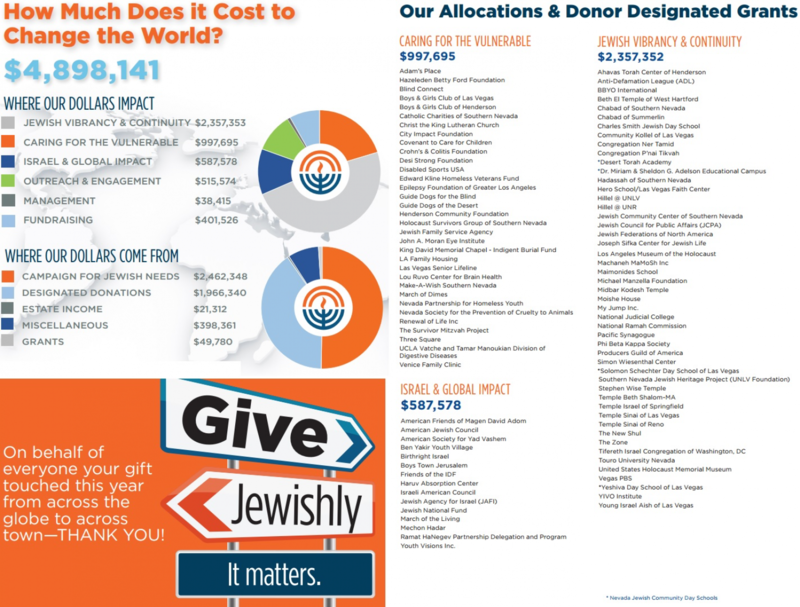 Funds are allocated to local Jewish agencies and programs for maximum impact, to collectively support what have always been our community's priorities - caring for people in need, connecting individuals and families to the Jewish community, and providing opportunities to discover personal Jewish identities. We collectively support what have always been our community's priorities - caring for people in need, connecting individuals and families to a Jewish way of life, offering meaningful opportunities for Jewish discovery, and supporting Jewish communities worldwide. Funds are also allocated to national, Israel, and overseas programs that fight global Jewish poverty, connect the Jewish people, rescue Jews at risk and ensure an Israeli democracy dedicated to Jewish pluralism. Allocating Community Campaign funds is a fair, democratic, and participatory process. More than 60 volunteers spend 640 hours over six months to make sure your gift goes to the programs that most effectively address the most critical needs in our community, and best support and nurture Jewish life locally and globally. They make sure your gift will be used wisely and with the greatest impact.